CMC Mechanical Lugs | PosiGrip Lugs | Solderless Lugs | Cal Fasteners, Inc.
CMC (Connector Manufacturing Company) is a full line manufacturer of aluminum and copper connectors, offering both mechanical and compression designs. 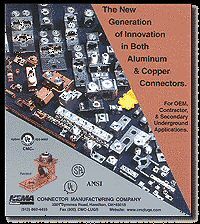 All of CMC’s products are manufactured in North America. Their philosophy is to provide only the highest quality products, utilizing labor saving designs and the latest production technology. Cal Fasteners, Inc., has been supplying CMC mechanical lugs, including PosiGrip® products, to customers around the world for over 35 years. Request a quote on CMC lugs for your application, or contact us to learn more. CMC’s PosiGrip aluminum dual-rated mechanical connectors are engineered to meet the requirements of UL 486B and CSA1165A specifications. Designed for low initial contact resistance, PosiGrip connectors include unique I-beam bodies and conductor hole configurations, specially treated screws, and other features that ensure exceptional performance and long working life in any application. All PosiGrip products are UL and CSA listed and RoHS compliant.